Where did you get those cloth diapers? My wife and I are stacking up on cloth diapers. We just bought a pack of 3 cloth diapers with inserts at Kulu duckbill at Market Market. They are only selling the Next9 brand. We're looking for other brands. Are you using a diaper liner for easy clean up? Have you seen cloth vlogs (http://www.youtube.com/playlist?list=PL2CE681574C00E83D)? And yes, I'm using a diaper liner made of fleece (cut out from fleece blanket) to catch poop and minimize stains. Or you can search "Cloth diapers" in multiply.com and you will see lots of shops selling there. There you go! Happy Nappy shopping! 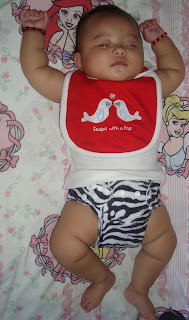 Hi there, I cloth diaper my son too.. are you a member of Modern Cloth Nappying Pinays? Yes Liz, I'm a member of MCNP, MTP and the groupbuy group.. Familiar ka nga sa akin eh.